Nestled among gently rolling farm fields in the southeastern corner of Iowa, the Cypress Villages land spans 144 acres. 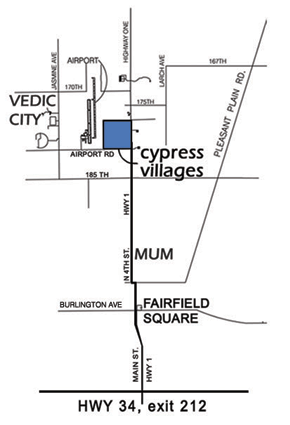 Just north of Fairfield, and east of Vedic City, Cypress Villages is about two hours away from the state capital, Des Moines. We have converting the old conventional corn and bean fields into USDA Certified Organic land. We are well underway, having planted high grade oats and alfalfa a few years ago to allow the land to rest and purify. The next phase will be to create permaculture crops that will feed our families and nourish the land at the same time! Turn left (west) on 177th St.